a controller board of the upper AVR performance class! 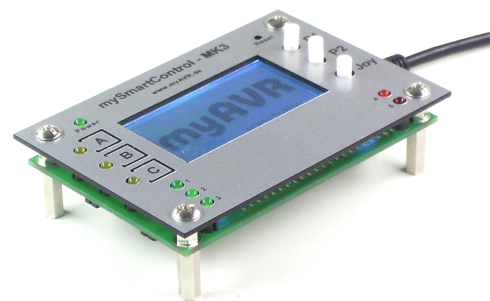 mySmartControl MK3 is a compact controller board of the upper AVR performance class, equipped with grafic-display, different input and output devices and also myAVR standard interface. 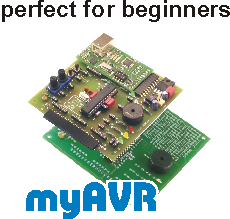 So it is an additional or alternative solution to our education and developing board myAVR Board MK3 and is maximal compatible to this board. 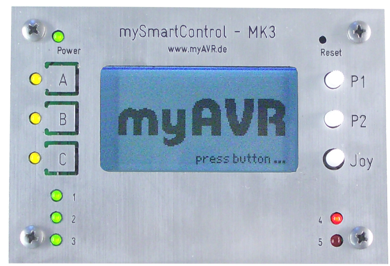 The programming of the mySmartControl MK3 is possible with a myAVR Stamp or a myAVR Board MK3. 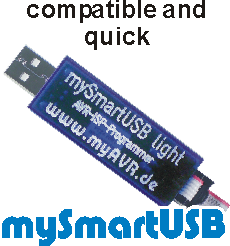 The programming of a myAVR Stamp is possible via pre-installed bootloader, by ISP or with a myAVR Board MK3. The power supply takes place over USB or a separate connection. An external power supply should be between 6 V and 12 V. In order to perform control tasks the module has a 20-pin extension connection as myAVR standard connection and further more capabilities of connecting. The communication with the PC runs completely transparent over a virtual COM-Port. It is small in size and yet multifunctional. 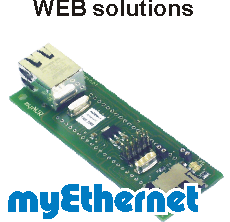 It can be used in small-sized systems as well as in professional applications. mySmartControl MK3 provides many possibilities for use and different options for equipping. The structure of the board is stable. There is no myAVR Stamp in the scope of supply!